The Frenchman's Food & Wine Blog: Solo Pizza - exquisite pizza! Or rather, era squisito! 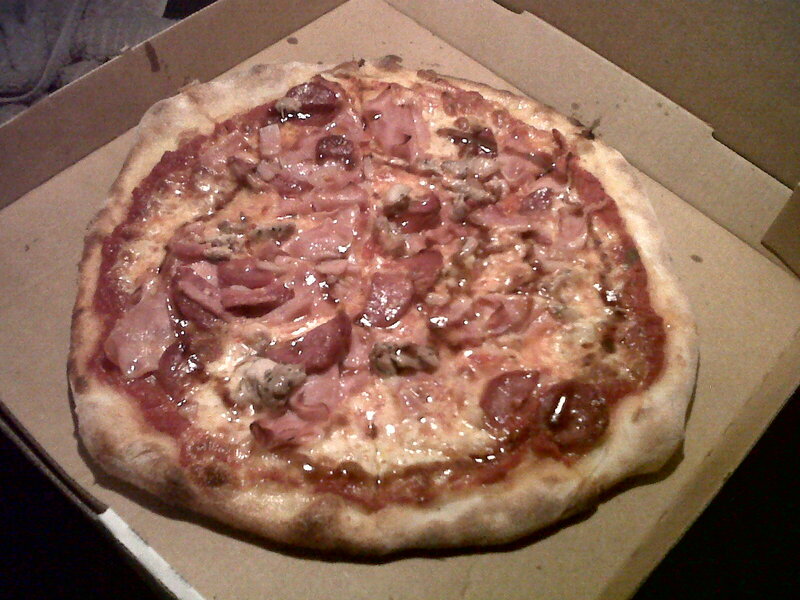 Solo Pizza - exquisite pizza! Or rather, era squisito! A new pizza joint in my neighbourhood just opened 2 weeks ago - Solo Pizza, run by an enthusiastic, cheerful young Italian couple, Giovanni and Stefania. It's on Coode Street in South Perth, near the corner of South Terrace. I ask Stefi why "Solo Pizza"? And she tells me that it's very simple. "Solo" in Italian means "just", as in "only". And that's what they want to focus upon - just pizza. And coffee, of course - what decent Italian place would be without an espresso machine? If you've read my previous posts, you might have gathered that I'm a true fan of artisanal foods. Foods prepared traditionally, by hand, with care, with flair, and pride in workmanship. The dough is made fresh every morning. And unlike your commercial mass produced stuff (which has its own place in the sun, but not on this blog), each pizza base is a lump of dough individually hand-rolled to order by Gio. I love the uneven edges - shows that it's real. What I love even more is the fact that they only do their pizzas in the one size. If you want a pizza, the choice should only be in deciding on the toppings, not how big your pizza should be. Speaking of toppings, there's also a Gio Pizza and Stefi Pizza. Apparently, Stefi's is much more popular. I turn up at 9.30pm on a Tuesday night when the rest of Perth appears to have gone home, and they cheerfully assure me that they're still open. Stefi is busy cutting up pre-cooked chicken breast fillets into little bite sized chunks for the next morning's trade, and Gio is busy making my pizza - the carne. I can't wait to get home to savour the flavour. The crust is beautifully thin and crispy. The toppings stay on each slice of pizza base which I pick up. The meat is flavorsome and varied. And with each 4th or 5th bite, I even taste fresh basil. Go. Buy some pizzas from Solo Pizza. Support this fantastic young couple. Average price of only $18.50 per pizza. And for that, you get an exquisite handmade pizza. I must confess that pizza is not my favourite food. But these guys have caused me to re-evaluate. For me, when it comes to pizza, sei solo tu, Solo Pizza.